The carcass of a clean animal that had not been properly slaughtered, or that of an unclean animal of the land, the water, or the air, polluted until the evening the person who touched it (Lev. xi. 24). One who carried or ate it must wash his clothes (ib. 25, 39, 40). A special prohibition was enacted against eating clean animals that had died (Lev. xxii. 8; Ezek. iv. 14, xliv. 31), and although this was intended primarily for priests, only the stranger in Israel could eat them (Deut. xiv. 21). Certain "creeping things" ("sheraẓim"), when dead, polluted not only persons, but also wooden utensils, clothes, leather, and sackcloth. These were to be dipped into water, after which they became clean in the evening (Lev. xi. 32). But food and beverages could not thus be made clean (Lev. xi. 34), nor could a stove, nor any earthenware upon which the carrion had dropped (Lev. xi. 35; compare vi. 21). Seeds were unclean only when damp (Lev. xi. 38). See also Burial, Corpse, Clean and Unclean Animals. Corpses, as well as inanimate things in the stage of dissolution and decay, must be removed from before the living God and from the people who dedicate themselves to Him (compare Lev. iii. 13, which commands the salting of meat offerings). The fear of dead bodies is due not merely to a physical revulsion against decay, but also to a sense of the mysterious curse attaching to mortality, especially of human bodies (Gen. ii. 17; iii. 19); it is, therefore, of ethical import (Dillmann's commentary on Lev. xi.). The fact that not only human carcasses, but also those of animals, were supposed to defile, militates against the supposition that these laws were intended to antagonize the pagan ancestor-worship. Dead animals often lay about in the cities (Tosef., Ṭoh. vi. 1), for the carrion of animals did not pollute the habitations in which it lay. So long as the animals were not altogether dead they did not pollute; but if the head had been cut off, as, for instance, that of a lizard, though its trunk might still be moving, it was considered as a carcass (ib. i. 4; Oh. i. 6). Not only did the entire body of the animal pollute, but even a single member, which in quadrupeds might be smaller than an olive, or, in reptiles, smaller than a lentil (ib. i. 7). If the carcass were that of a clean bird, concerning which thirteen rules had to be observed (Ṭoh. i. 1), it was more defiling in certain respects than that of an unclean bird (ib. i. 3). According to Lev. xi. 29, the carcasses of only eight amphibious animals polluted, which were specifically called "creeping things" (sheraẓim); opposed to these as the type of a clean animal was the frog (ib. v. 1, 4). In post-Talmudic times the ordinances regarding the carcasses of "creeping things" were no longer observed, since none of the ordinances of purification were in force. 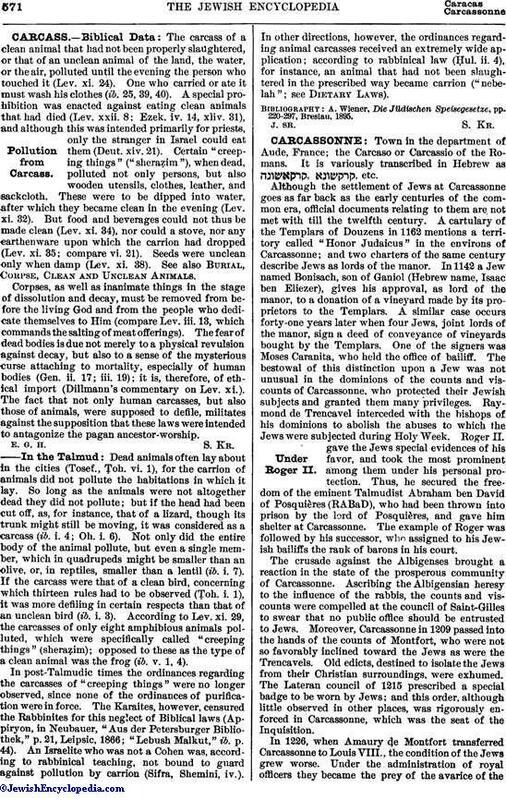 The Karaites, however, censured the Rabbinites for this neglect of Biblical laws (Appiryon, in Neubauer, "Aus der Petersburger Bibliothek," p. 21, Leipsic, 1866; "Lebush Malkut," ib. p. 44). An Israelite who was not a Cohen was, according to rabbinical teaching, not bound to guard against pollution by carrion (Sifra, Shemini, iv.). In other directions, however, the ordinances regarding animal carcasses received an extremely wide application; according to rabbinical law (Ḥul. ii. 4), for instance, an animal that had not been slaughtered in the prescribed way became carrion ("nebelah"; see Dietary Laws). A. Wiener, Die Jüdischen Speisegesetze, pp. 220-297, Breslau, 1895.